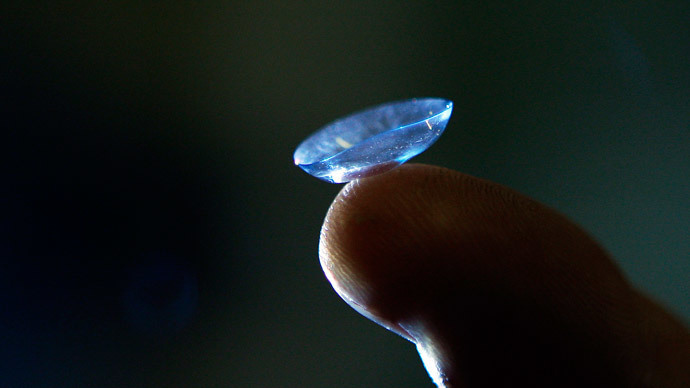 A revolutionary new contact lens with a built in telescope could help millions to regain their full sight. Just a wink of one’s eye is enough to zoom in or turn the telescope off, which increases peripheral vision three fold. The new technology is set to help sufferers of age-related macular degeneration (AMD), which can result in the loss of vision in the center of the visual field. This makes it difficult to read and recognize faces. The 1.55mm thick lens contains an extremely thin, reflective telescope. Small mirrors inside bounce light around, expanding the perceived size of objects and magnifying the view, similar to looking through low-magnification binoculars. It is very simple to operate with the lens working in conjunction with glasses. A simple wink of the right eye makes the telescope zoom in, while if the user winks with their left eye, then the telescope is turned off. “The most compelling reason why you would want to have this is to help people with serious visual problems, such as macular degeneration, or other retinal illnesses where people have severe vision loss,” said Dr. Eric Tremblay, who is a designer with the Swiss Federal Institute of Technology, which is based in Lausanne. “In a lot of cases magnification is very useful. So what people usually use are head-mounted telescopes which don’t work for everything,” which was reported by the Daily Telegraph. The contact lens had an unlikely source for funding, with DARPA, the Pentagon’s research agency providing the cash. They wanted it to be developed to give soldiers a form of bionic vision. “They were really interested in supervision, but the reality is more tame than that,” said Tremblay at the American Association for the Advancement of Science in San Jose. So far, only five people have tested the latest version, according to the Guardian. There are currently telescope glasses on the market, however they have proved to be cumbersome and expensive for the public, with the technology on sale at $9,240. The new makers of the lens say the new design will be much cheaper. However, it will need some more work before it can be sod publicly as the user can only currently wear it for 30 minutes, as it blocks oxygen to the eye. Cathy Yelf, the acting CEO of the Macular Society, said: “There is virtue in having a zoomable contact lens for some people with macular degeneration who have lost their central vision. We will be interested to see how, in practice, it works for people with AMD. With an ageing population, investment in research and new treatments is a pressing issue as there,” she said.